Objective: The present study was conducted to uncover the diagnostic accuracy of digital versus conventional radiographic methods for the detection of proximal caries in primary teeth. Methods: Two researchers independently involved in the search process to explore Medical Subject Heading terms "dental digital radiography," "dental radiography," "bitewing," "dental caries," and "primary teeth" using PubMed, Cochrane Library, Ovid SP, and SIGLE databases. Search was confined to the articles published in English language only, with time period limit January 1996 to April 2014 and a hand search was performed to retrieve additional citations. Explicit inclusion and exclusion criteria were applied to eliminate undesired studies. Critical appraisal of the retrieved articles was done using the quality rating based on Bader and co-workers criteria. Results: A total of 129 articles were retrieved, among which 4 articles were included. All the four studies included were in vitro, of which two studies attained a high-quality score, whereas the other two attained average, and low scores based on Bader et al. 's criteria. 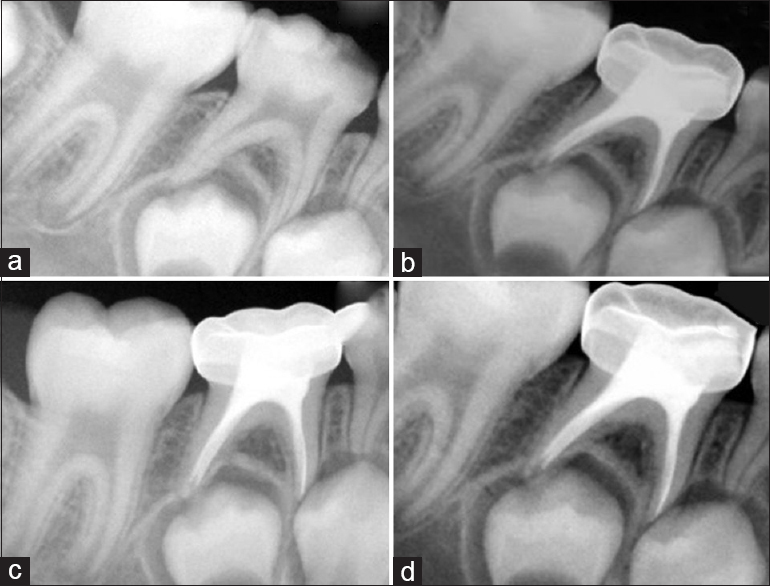 Conclusions: A big lacuna exists in the literature, regarding the evaluation of radiographic systems in primary teeth, suggesting an immediate need for well conducted in vivo studies. 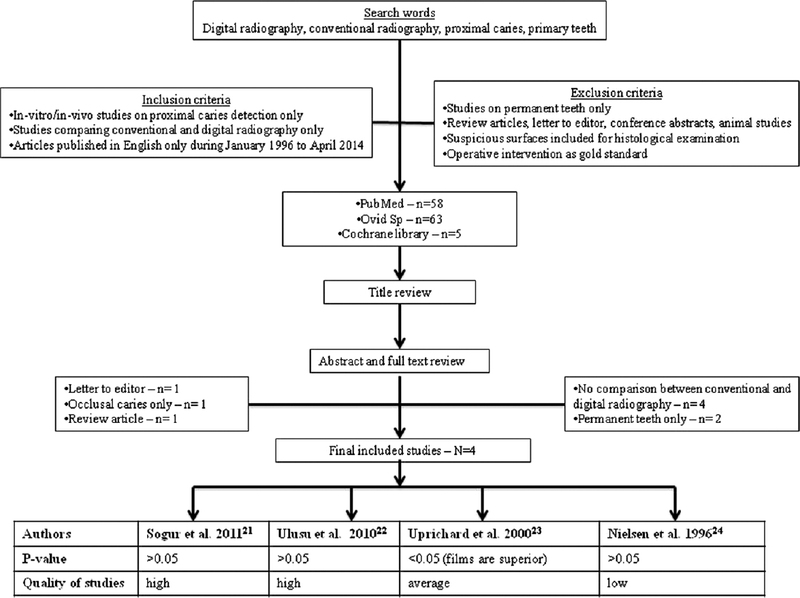 The quality of available evidence can be regarded as fair but cannot be suggested to set a baseline, indicating a need to perform high-quality studies in a randomized sample to find out the accuracy of digital and conventional radiographs. Context: Dental caries is one of the major modern-day diseases of dental hard tissue. It may affect both normal and hearing-impaired children. Aims: This study is aimed to evaluate and compare the prevalence of dental caries in hearing-impaired and normal children of Malda, West Bengal, utilizing the Caries Assessment Spectrum and Treatment (CAST). Settings and Design: In a cross-sectional, case-control study of dental caries status of 6-12-year-old children was assessed. Subjects and Methods: Statistically significant difference was found in studied (hearing-impaired) and control group (normal children). In the present study, caries affected hearing-impaired children found to be about 30.51% compared to 15.81% in normal children, and the result was statistically significant. Regarding individual caries assessment criteria, nearly all subgroups reflect statistically significant difference except sealed tooth structure group, internal caries-related discoloration in dentin, and distinct cavitation into dentine group, and the result is significant at P < 0.05. Statistical Analysis Used: Statistical analysis was carried out utilizing Z-test. Results: Statistically significant difference was found in studied (hearing-impaired) and control group (normal children). In the present study, caries effected hearing-impaired children found about 30.51% instead of 15.81% in normal children, and the result was statistically significant (P < 0.05). Regarding individual caries assessment criteria, nearly all subgroups reflect statistically significant difference except sealed tooth structure group, internal caries-related discoloration in dentin, and distinct cavitation into dentine group. Conclusions: Dental health of hearing-impaired children was found unsatisfactory than normal children when studied in relation to dental caries status evaluated with CAST. Background: Growth can be one of the most uncertain variations, but understanding the same is very important for diagnosis and treatment planning. Skeletal age and dental age have been used to determine a child's developmental age. Several researchers have evaluated the association between dental and skeletal maturity with chronologic age on different population. The purpose of the present study was to find out whether dental age estimation can be replaced for skeletal age estimation in the Dakshina Kannada population. Methods: A total of 104 samples equally distributed among both genders in the age group of 9-14 years were selected. Skeletal age was estimated using hand-wrist radiographs and Fishman's skeletal maturation index and dental age was measured using Demirjian's method. Results: Spearman's rank-order correlation coefficients were used to measure the association between the skeletal maturity and dental maturity. The mean ages of male and female samples were determined as 11.89 ± 1.867 years and 12.21 ± 1.473 years, respectively. Chronological age was found to be positively correlated to dental age and skeletal age and found to be statistically significant (P < 0.01). The correlation between dental age and skeletal age was also found to be statistically significant with P < 0.001 and correlation coefficient of 0.683 and 0.704 for males and females. Conclusion: The present study showed a strong relation between the developmental ages in mixed dentition population; hence, dental age can be considered as a replacement in the study population. Context: In response to the propagation of various anti-Streptococcus preventive agents, the discovery of newer and more efficient agents which are more economical, efficacious, and safe are gaining popularity in today's era. Aims: The purpose was to compare the antimicrobial efficacy of multi-herbal mouth rinse with essential oil-based, fluoride containing, and 0.2% chlorhexidine digluconate mouth rinses, well-evidenced chemical formulations, against Streptococcus mutans. Settings and Design: It is triple-blinded randomized controlled trial. Methodology: One hundred and twenty adolescents aged between 15 and 17 years were randomized into four groups: (a) multi-herbal mouth rinse, 15 ml twice a day; (b) 0.2% chlorhexidine mouth rinse, 15 ml twice a day; (c) essential oil mouth rinse, 15 ml twice a day (d) 0.2% sodium fluoride mouth rinse, twice a day. Salivary and plaque samples were collected from subjects and oral streptococci colony forming units (CFUs)/mL was assessed using TYCSB agar. Statistical Analysis Used: Repeated measures of ANOVA were used to compare the various mouthrinses followed by post hoc Bonferroni test for comparing multi-herbal mouthrinse with other mouthrinses. Significance was set at P < 0.05. Results: At baseline, there was no statistically significant difference in the distribution of baseline data groups, but reduction of S. mutans colony count of multi-herbal mouth rinse in comparison with the other mouthrinses had statistically significant values except Fluoride mouth rinse till 1 week postrinsing. Conclusion: Chlorhexidine and multi-herbal mouth rinses showed statistically significant reduction in the S. mutans CFU count, in terms of efficacy and substantivity both. Introduction: A major objective in restorative dentistry is the control of marginal leakage, which may occur because of dimensional changes or lack of adaptation of restorative material to the cavity preparation. Numerous techniques have been advocated to overcome polymerization shrinkage in composite restorations. Aim and Objectives: This study investigated microleakage of three different bases under composite resin in sandwich technique using dye penetration and dentin surface interface using scanning electron microscope (SEM). Materials and Methods: Sixty extracted deciduous molars were stored in distilled water and Class I cavities with a width of about one-fourth of intercuspal distance and a depth of 0.5-1 mm below the dentino-enamel junction was prepared without bevels. In Group 1 - glass ionomer cement (GIC); Group 2 - mineral trioxide aggregate (MTA); Group 3 - Biodentine™ was placed as a base under composite. Teeth were longitudinally sectioned in two halves, through the centers of the restoration, immersed in 2% methylene blue and microleakage was evaluated under stereomicroscope and surface interface between base and dentin was evaluated under SEM. Results:Under the condition of in vitro study, less microleakage and less internal gaps were seen in Biodentine™ (0.00 ± 0.00 and 4.00 ± 1.59) group than MTA (0.00 ± 0.00 and 6.08 ± 1.82) and GIC (25.25 ± 6.57 and 14.73 ± 3.72, respectively) and showed very strong positive correlation between microleakage and internal gaps. Conclusion: Biodentine™ exhibits superior marginal sealing ability as well as marginal adaptation under composite resin as compared to MTA and GIC. Background: A common strategy to correct Class II malocclusions using a nonextraction protocol in children is to move the maxillary molars distally using molar distalization appliances, which usually derive their anchorage from maxillary premolars, causing mesialization of premolars and protrusion of incisors. Objectives: To evaluate the skeletal, dental and soft tissue changes produced by three different distalizing appliances, namely, pendulum, K-loop, and distal jet appliances. Materials and Methods: Sixty-six children of mean age 14.13 years requiring molar distalization were divided into three groups: Group I (pendulum appliance), Group II (K-loop), and Group III (distal jet). Lateral cephalometric films were taken before and after 5 months of molar distalization and following cephalometric parameters were used to assess the effects of maxillary molar distalization, namely, anteroposterior skeletal (SNA/SNB/ANB), vertical skeletal (face height ratio/Frankfort-mandibular plane [FMA]/angle formed between Maxillary plane & Mandibular plane (MM)), interdental (overjet/overbite), maxillary dentoalveolar, and soft tissue parameters. Results: There was no significant age difference between the three groups. In overall treatment changes among the three groups, the Anteroposterior skeletal changes were not statistically significant, vertically FMA angle increased by 1.79° ± 2.25° and overbite reduced by 2.38 ± 1.83 mm. 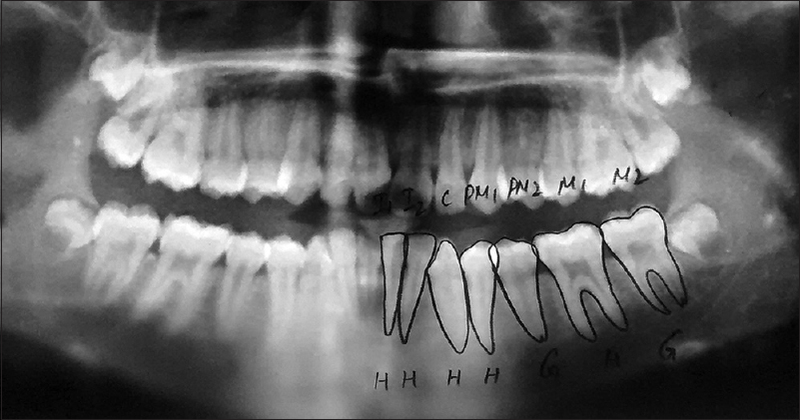 The maxillary first molars were distalized by an average of 4.70 ± 3.01 mm (Upper 6 [U6] to pterygoid vertical [PTV]). The maxillary central incisor labial tipping increased to an average of 1.61 ± 2.73 mm and cant of upper lip increased by 3.40° ± 5.88° are statistically significant (P < 0.05). Conclusion: All three distalization techniques in growing children produced significant effects on anchor unit. There was an increase in FMA angle, significant bite opening, proclination of the maxillary incisors and increase in the cant of the upper lip. Context: To investigate the antibiotic prescribing training received by dental students, clinical experience in treating child patients, awareness of antibiotic prescribing guidelines, preparedness in antibiotic prescribing, and compliance with antibiotic prescribing guidelines for the management of dental infections in children. Methods: This was a cross-sectional study involving final year dentals students from Malaysian and Asian dental schools. A self-administered questionnaire consisting of five clinical case scenarios was e-mailed to all final year students at selected dental schools. Students' responses were compared for each clinical case scenario with the prescribing guidelines of the American Academy of Pediatric Dentistry and the American Dental Association. Compliance in each scenario was tested for association with their preparedness in antibiotic prescribing, previous training on antibiotic prescribing and awareness of antibiotic prescribing guidelines using Chi-square test. Data collected were analyzed using SPSS statistics version 20. Results: A total of 108 completed responses were received. About 74 (69%) students were from Malaysian dental schools. The compliance rate with prescribing guidelines ranged from 15.7% to 43.5%. Those attending Malaysian dental schools (47.3%) and those who had treated child patient more often (46.3%) were more likely (P < 0.05) to be aware of the guidelines. Those who had received antibiotic prescribing training (21.3%) were more likely to think they were well prepared in antibiotic prescribing (P < 0.05). Conclusions: Final year dental students had low awareness and compliance with antibiotic prescribing guidelines. Further research is needed to investigate how compliance with the guidelines may be enhanced. Introduction: Child's behavior on dental visit depends on variables such as age, parental behavior, parental anxiety, medical/dental history, and dental procedures. Behavioral-screening questionnaire, such as the Strengths and Difficulties Questionnaire (SDQ), can be used to preassess the child's mental health status which further predicts child behavioral pattern in dental clinics. Aim: To measure emotional status among children of 3-14 years age group attending dental clinics. Methodology: A total of 176 parents of children aged 3-14 years were involved in this study. The child's emotional and behavioral statuses were assessed using SDQ. Results: On analyzing the SDQ data, it was found that 80% of children came under the abnormal category whereas only 8% of children were found to be in normal category. Twelve percent of children came under borderline category. On the individual behavioral subsets scores, 13% were rated as abnormal on emotional subset, 40% on conduct problems, 12% on hyperactivity, and 29% on peer problems subset. Conclusion: Findings of this study suggest that incorporating tools to identify the current emotional state would give a clue and allow the dentist to develop a behavior guidance plan to accomplish the necessary oral health care. However, the results are preliminary; studies with larger sample should be done to validate the results among diverse populations. Aims: The aim of the present study was to evaluate and compare the sealing ability of root canal obturation after the application of fluoride varnish (MI Varnish) containing 5% sodium fluoride and casein phosphopeptide-amorphous calcium phosphate, fluoride varnish, and AH Plus and AH-Plus as root canal sealer by bacterial penetration test. Materials and Methods: Root canals of 65 single-rooted and single-canalled teeth were prepared. They were divided into three experimental groups (n = 15) and two control groups (n = 10). The root canal walls in Group I were coated with AH Plus, Group II were coated with AH Plus and fluoride varnish, and Group III were coated with fluoride varnish. All the teeth were obturated with gutta-percha using the lateral condensation technique. Enterococcus faecalis were used as test bacteria to determine the leakage during 100 days. Statistical Analysis: The data were analyzed using log-rank test and Kaplan-Meier survival analysis. Results: Group III showed significantly less bacterial penetration as compared to Group I (P = 0.01) and Group II (P = 0.03). However, there was no statistical significance between Groups I and II (P = 0.672). Conclusions: It can be concluded from the present study that fluoride varnish can be used as a root canal sealer. However, further in vitro and in vivo studies are required. Background: Child dental neglect is the failure of a parent or guardian to meet the child's basic oral health needs such that the child enjoys adequate function and freedom from pain and infection, where reasonable resources are available to family or caregiver. Aim: The aim of the study is to evaluate the phenomenon of dental neglect among children in Chennai and to associate dental neglect with oral health status of children aged 3-12 years. Materials and Methods: This is a cross-sectional study involving 478 pairs of parents and children. Dental neglect scale and a questionnaire were used to assess the dental neglect score among parents of the children involved in the study. Oral health status of children was clinically assessed using oral hygiene index, decayed, extracted, filled teeth (def(t)), pulp, ulcers, fistula, abscess (pufa), decayed, missing, filled teeth (DMFT), PUFA as per the World Health Organization criteria and pufa/PUFA index. Student's t-test and one-way ANOVA were used appropriately for statistical analysis using SPSS software version 20.0. Results: A significant higher dental neglect score was reported among the parents who reside in the suburban location (P < 0.001), whose educational qualification was secondary (P < 0.001) and who have not availed any dental service for >3 years (P = 0.001). 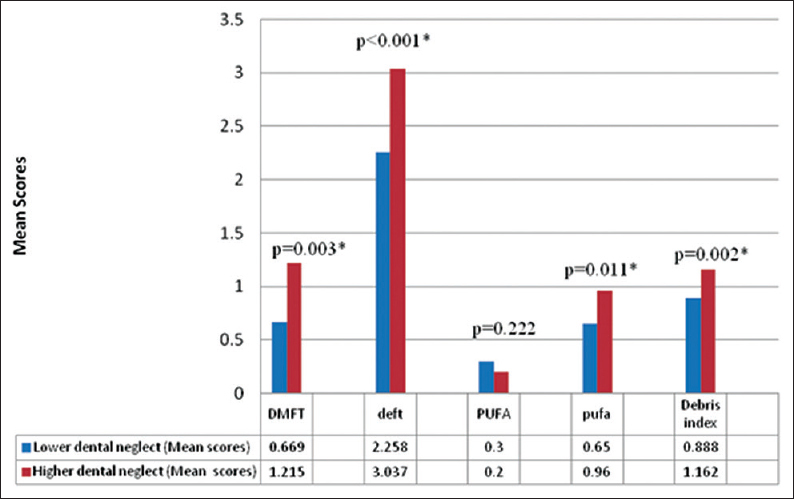 A significant higher DMFT (P = 0.003), deft (P = 0 < 0.001), pufa (P = 0.011), and debris index (P = 0.002) scores were seen in the higher dental neglect group. 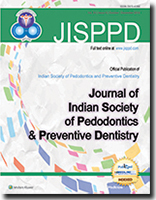 Conclusion: Child dental neglect is seen among the parents whose educational qualification was secondary, who reside in the suburban location, and who have not utilized the dental services for more than 3 years in Chennai. This dental neglect results in poorer oral health of children. Aim: To analyze the cariogenic microbiota of children who are under antineoplastic therapy. Methods: Twenty-seven patients undergoing cancer treatment in the Pediatric Unit of Mato Grosso Cancer Hospital were selected. The inclusion criteria of volunteers were being under chemotherapy in the saliva collection period, age between 2 and 18 years, collaborate with the protocol for clinical examination and saliva collection, and responsible have given their written consent. For the realization of lactobacilli and Streptococcus mutans count in the patients' saliva, respectively, Dentalcult I and II (LaborClin; ) kits were used. Statistical Analysis: Kruskal-Wallis and Fisher's exact tests were used to assess the association of the variables age group, prevalence of lactobacilli and S. mutans, diagnosis of patients, presence and level of decay of patients defined by decayed, filled, and missing teeth (DMFT)/dmft indexes with a significance level of 5%. Results: The group of patients consisted of 27 children, 15 males, and 12 females; 44% were aged between 6 and 10 years; 61% had present or past history of caries (dmft/DMFT >0); 48% had low value for Dentalcult I; 59% presented value grade 0 to Dentalcult II; and 63% were diagnosed with acute lymphoid leukemia. Conclusion: There was a high prevalence of dental caries in the study population but low rates of S. mutans and lactobacilli in the saliva of the children. Lactobacilli rate was significantly associated with caries index scores, and the prevalence of caries was directly associated with the age group of the children. Aim: To evaluate the fracture resistance in simulated immature teeth that had been backfilled using composite resin and Biodentine after using Biodentine as an apical plug material immediately and after 3 months of aging. 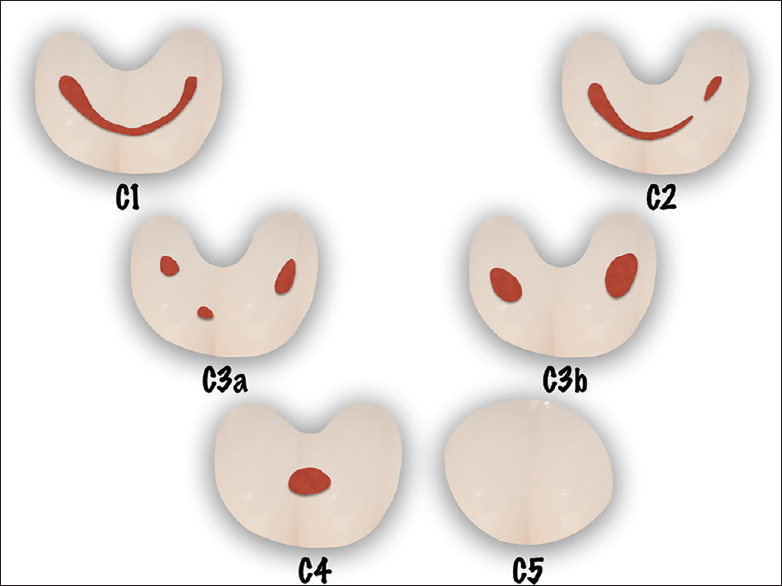 Materials and Methods: Sixty extracted human maxillary central incisors were simulated in an immature open apex. 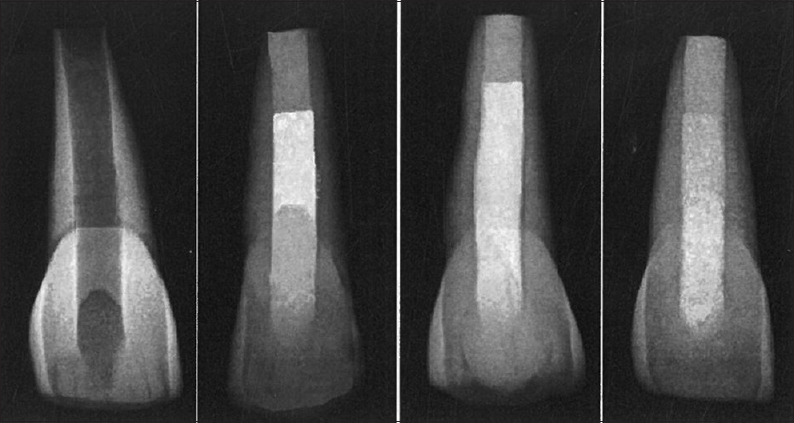 The roots of all the specimens were then standardized to a length of 10 mm and canals were instrumented to obtain the radicular dentin thickness around 1.5 mm. All the specimens were then randomly divided into three groups of twenty teeth each. Group I (control) - 4 mm apical plug of Biodentine backfilled with thermoplasticized gutta-percha. Group II - 4 mm apical plug of Biodentine and then backfilled with ParaCore. Group III - completely filled with Biodentine. Ten samples from each group were randomly divided into two subgroups. In subgroup A: Specimens were stored for 1 week. In subgroup B: Specimens were stored in phosphate-buffered saline solution for 3 months and were subjected to universal testing machine. Statistical analysis was done using one-way analysis. Results: No significant difference in fracture resistance between the groups was observed when tested immediately. After 3 months of aging, only Biodentine group showed a significant reduction in fracture resistance without significant reduction with other two groups. Conclusion: Biodentine group has shown a drastic reduction in fracture resistance after 3 months of aging, and hence cannot be recommended as a reinforcement material in immature teeth with thin dentin walls. Context: Reduction of the bacterial populations to levels compatible with periradicular tissue healing is the primary microbiological goal of the endodontic treatment of teeth with apical periodontitis. The number of visits required to treat teeth with apical periodontitis represents one of the most debatable issues in endodontics. Objectives: The objective of this study was to compare and evaluate the clinical and radiographic outcome of single- versus two-visit pulpectomy treatment in primary teeth with apical periodontitis at the end of 6-month healing period. Settings and Design: A parallel group, double-blind, randomized controlled trial was carried out in 64 children aged 4-8 years. Nonvital primary teeth with apical periodontitis with enough coronal structure were selected. Sixty-four children were assigned randomly into two groups (32 children each) by block randomization, and allocation concealment was done with closed envelop method. Methods and Materials: Group I underwent single-visit pulpectomy followed by obturation with zinc oxide eugenol (ZOE). Group II underwent conventional two-visit pulpectomy with intracanal calcium hydroxide, followed by obturation with ZOE. Postoperative clinical and radiographic evaluation was carried out at 1, 3, and 6 months after the end of the treatment. Statistical Analysis Used: The data were analyzed by Wilcoxon's signed rank test, Mann-Whitney U-test, and Friedman test. Results: There was no statistically significant difference in clinical and radiographic outcomes in both the groups at the end of 6-month healing period. Conclusion: Single-visit pulpectomy can be considered as a viable option for the treatment of primary teeth with apical periodontitis. Aim: The study aims to evaluate the effect of the application of two antioxidants on the bond strength of composite resin to bleached enamel. Materials and Methods: Eighty enamel surfaces were obtained from forty human extracted premolars. Specimens were randomly divided into four groups (n = 20). 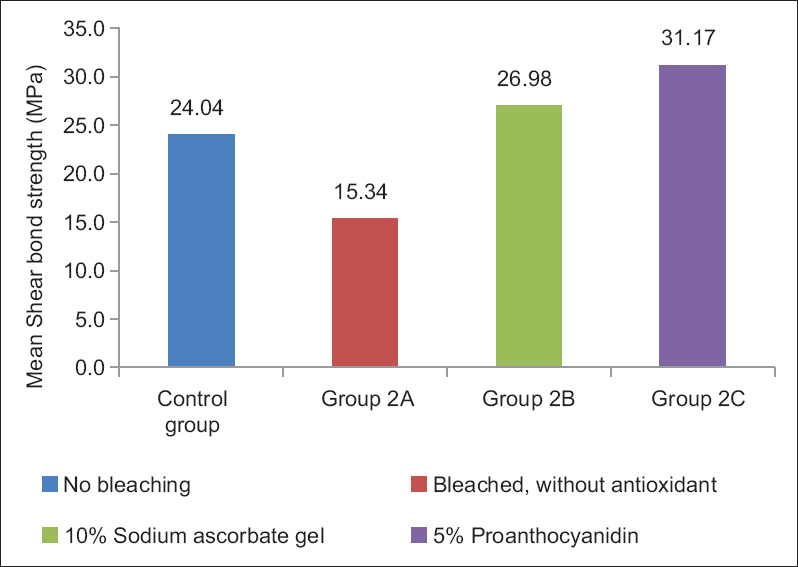 Group 1: No bleaching (control); Group 2a: Bleaching with 15% carbamide peroxide gel; Group 2b: Bleaching, followed by application of 10% sodium ascorbate gel; Group 2c: Bleaching, followed by application of 5% proanthocyanidin agent. Surfaces were etched followed by application of total etch bonding system, and composite resin cylinders were bonded. Specimens were tested for shear bond strength. 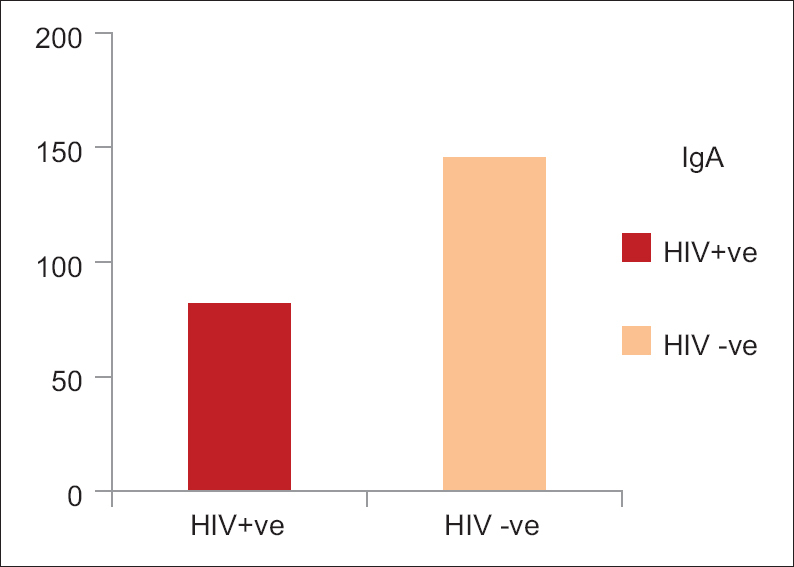 Statistical Analysis Used: One-way analysis of variance was used for multiple group comparison and post hoc Tukey's test for individual group-wise comparison. Results: Significantly higher shear bond strength values were observed in Group 2c and 2b as compared with Group 1 and 2a (P < 0.05). Among the antioxidants, Group 2c showed significantly higher shear bond strength values than Group 2b (P < 0.05). 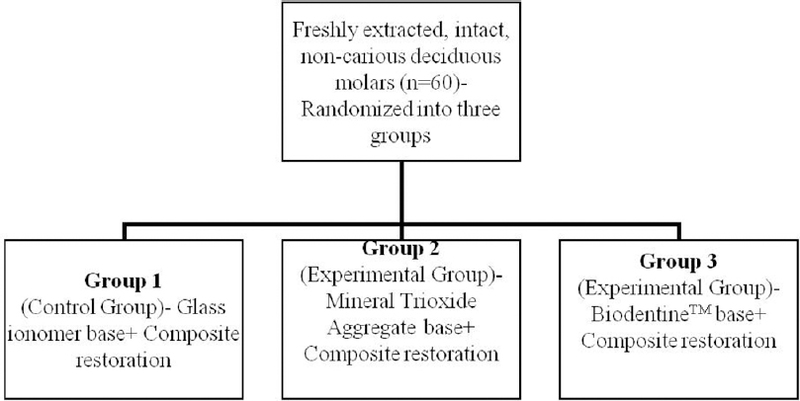 Conclusion: It can be concluded that the use of antioxidant before bonding procedures on bleached enamel completely neutralizes the deleterious effects of bleaching and increases the bond strength significantly. Knowledge of the different anatomical variations in root canal system of dedicious dentition will improve the practice of the pediatric dentists. The teeth with C-shaped root canal configurations are definitely a problem in endodontic treatment. Dentists who are specialists of endodontics must have adequate knowledge about various root canal morphologies of primary tooth that have a tendency for rapid progression of dental caries to achieve a technically satisfactory outcome. This report presents an extraordinary case of unusual tooth morphology involving the mandibular first primary molar with a C-shaped configuration which has not yet been reported.